A number of Russian and international organizations are engaged in efforts to save the Amur leopard, and conservation plans include increasing the current population as well as development of a captive breeding center in order to establish a second, separate population. Very little is known about Amur leopard ecology, however, making it difficult to move forward effectively with recovery plans, evaluate ongoing conservation activities, and define future priorities. WCS is conducting scientific research to improve our understanding of this sub-species, and is also working to improve wildlife and habitat protection and management in the leopard’s range. information on a Amur leopard. the relationship between tigers and leopards, and how to mitigate competition between the two species. Since 2002, WCS has been using camera trapping to survey the leopard population over a significant portion of its range. Before 2002, camera traps had never been used for population monitoring in Russia, but this method has turned out to be very effective. Camera trapping allows us identify individual leopards by their unique spot patterns, and therefore we are able to monitor individual animals over many years, estimate population density and trends over time, and learn about rates of population turnover. Since 2002, WCS has camera-trapped between 8 and 16 Amur leopards on a study area at the northern end of the leopard's range. 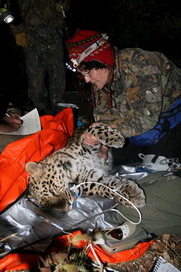 Since 1997, WCS has also assisted in implementing snow-track surveys, a method first used by Russian scientists for estimating leopard density and distribution in the 1970s. We attempt to repeat snow track counts every 3 years. Camera-trap results between 2002 and 2007 by our crew, and more recently by WWF in an adjacent site, as well as recent snow-track counts (2000, 2003, 2007, 2013) indicate to a small but stable population of approximately 30 to 35 leopards in Russia. WCS is engaged in several activities to improve wildlife and habitat management in leopard range. 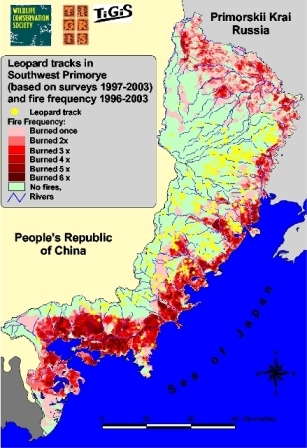 In 2004 we teamed up with TIGIS and Tigris in a study of the impacts of fires in leopard habitat. In 2009 we started a fire suppression and prevention project with a focus on two model areas in co-operation with Phoenix Fund, the recently established Land of the Leopard National Park and the Slavyanka Municipality. In the 280 km2 model area where we first started our work, the area that burned was reduced by 99% in 2011 and 80% in 2012 compared to what would have burned without our interventions. Finally, in co-operation with Phoenix Fund, we introduced the SMART patrol monitoring system in the National Park “Land of the Leopard”, which provides rapid assessments of the activities and impact of anti-poaching brigades working inside the protected area as well as in surrounding areas. We provide support for anti-poaching patrols (fuel for patrol vehicles, spare parts, ranger outfits) and funds for an incentive system that rewards patrol teams that perform well. This has resulted in a marked increase in patrol efforts. For instance, the distance of foot patrols and the time that teams spent on patrols doubled in the first quarter of 2012 compared to the first quarter of 2011. The increased patrol efforts, in turn, resulted in a sharp increase in law enforcement results, such as confiscated fire arms and fines for poaching and other violations. Read more about our efforts to protect leopard habitat against fires. Read more about our efforts to reduce poaching.